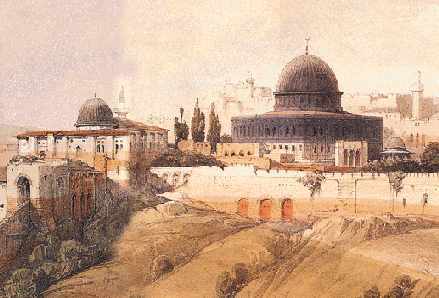 The site of Al-Quds (Jerusalem) was occupied during the Stone Age, but the aboriginal inhabitants were driven out in the period from 5000 BC to 4000 BC by a people who had advanced into the Bronze Age. About 2500 BC Jubusites built the first city in the area later known as Jerusalem. Jubusites are Sept of Canaanites who came from the Arabic Island about 3000 BC and established the Canaan country in the region to the west of Jordan River later known as Palestine. Jubusites called the new city "Urusalim" which means the city of Salim, the Canaanites God of peace. Jubusites built a wall around the city with a high tower in one of its corners. They also built tunnels through the rocks under the ground to carry water from Jeehon spring to the tanks under the walled city. The excavations done by the English archeologist Kathleen M. Kenyon in 1961 reveals the reminds of the Jubusites wall and tunnels. In the 15th century BC, Urusalim and the whole Canaanites cities were ruled by the ancient Egyptians during the conquests of King Thutmose III. Among the early records referring to Jerusalem are Egyptian tablets (execration texts) dating from about 1400 BC that name the city "Urusalim". In about 1250 BC Hebrews from Egypt began their conquest of Canaan country. So powerfully fortified was Jerusalem, however, that it did not fall until more than 200 years later. In 1000 BC, some years after being anointed King of Israel, David finally captured the city.